Please feel free to share . 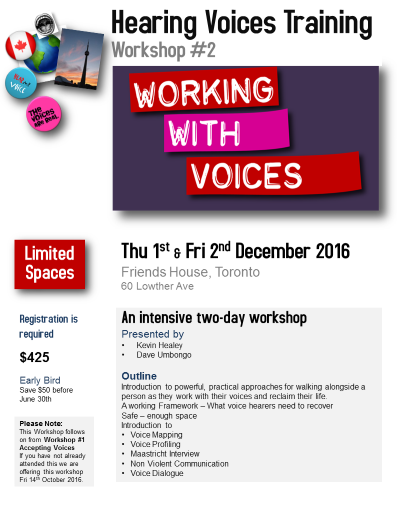 This workshop follows on from Workshop #1 Accepting Voices which provides a foundation for this work. If you have not already attended this we are offering it Fri 14th October 2016. Our intention is that you go away with a deeper understanding of voices, insights you can integrate into your worldview, and practical ways of working in the safe spaces you create with people who hear voices. As well, and more generally we hope you will feel better equipped to play your role in enacting a world that understands voice hearing – a world that is easier for us all to live in. This workshop builds on Workshop #1 Accepting Voices and offers you a solid introduction to important practical approaches that can aid in a person finding their own power to change their relationship with voices they find troubling. These include: voice mapping, voice profiling, Maastricht Interview, voice dialogue, and Non-Violent Communication. The overall approach is recovery oriented, rooted in openness, curiosity and possibility; assuming no limits to what a person can do, no limits to the changes they can make in their own life – made easier with support within a society that understands. We will also spend time understanding the role that voices can play in trauma, and the importance of preparing for when things get tricky, difficult and painful, including consideration of the other supports a person may need to have in place or to find in order to get through what can be a painful process. Working with voices is always a choice that can only be made by the person hearing voices. By presenting an introduction to a handful of approaches that can be used singly or any combination we hope you will become comfortable – not so much with adhering to techniques, or following steps as seeing these approaches as ways to build relationship, explore, learn together, always letting the person you support take the lead, make choices, find and use their power. This is not presented as therapy or a manualized approach but the material and ideas do lend themselves to being integrating into counselling or therapy work; some are structured, some very intuitive, iterative and creative. The workshop design draws from and mirrors the best of peer work and counselling – not only in shared values but also in the way we share some simple ways of working and of working-through complex, difficult, even distressing experiences yet with firm belief that how a person uses them is entirely and always their choice. Also, we open ourselves to exploring our own experiences using that to connect with others, willing to share our own vulnerabilities, yet always remembering and recognizing that it is the person we support who is doing the hard work. We hope that you will go away less fearful and able to help others be less fearful of experiences like hearing voices, equipped with ways you can become more curious and even fascinated by the amazing people that you will meet and have the privilege to support as they find and use their power and learn to work with their voices. In the end this workshop is designed to share useful material but mostly to help you be more open, curious and willing to learn about a person’s own experience – to deepen and broaden your own ability to understand so that you can join us in enacting a world that understands voice hearing, supports the needs of individuals who hear voices and views them as full citizens. If you have already attended Workshop #1 Accepting Voices*, you will have learned something of how you can offer yourself as a one-person safe space to a person who hears voices. 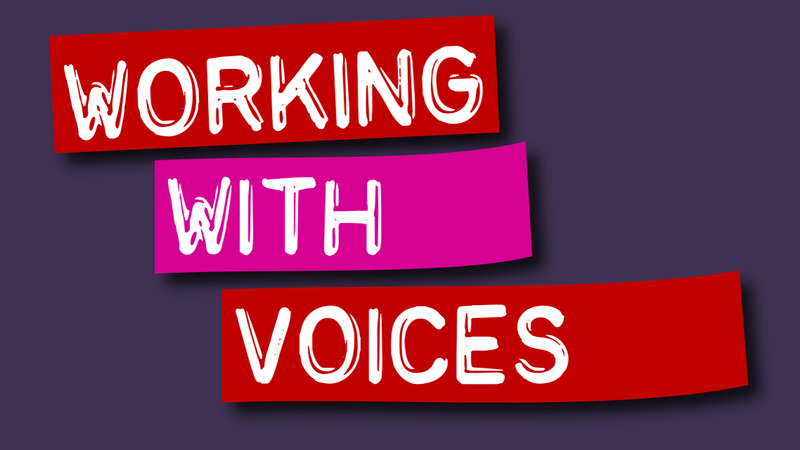 This second workshop will enable you to continue that work with increasing confidence, sharing your belief that voices can be understood in context of a life and the possibility that people can find their power and learn to make changes in their experience. This is not a prescriptive linear process but rather basic steps in learning how to walk alongside a person as they embark on “an adventure in unveiling” and learning to make choices and find what “works for me”. It will also enable you to expand and deepen the safe space you can create, adding to your repertoire of ideas, resources, approaches you can share, and the work you can offer to do with a person inside that safe space. Essentially this workshop is designed for workers who spend regular time with individuals who hear voices and struggle with their experience. Doctors, therapists, counsellors, peer workers community workers – anyone working in the health system, mental health services. 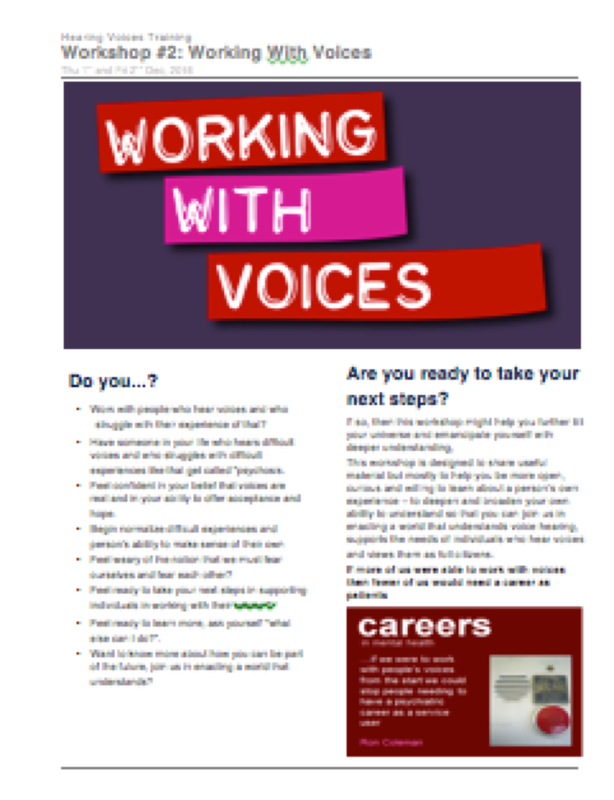 It can also be suitable for anyone who spends time supporting someone who struggles with voices and yet does not get paid for their work- and who wants to deepen and expand their own understanding of the roles voices can play in a person’s life, ways of understanding, key information, ways of engaging. So, if you encounter people who struggle with the voices they hear and feel you need to understand, and you are ready to play your role in enacting a world that understands, then you may decide this workshop is for you. Please note that if you have not already attended Workshop #1 Accepting Voices* then you will need to join us in February. *Note – Workshop #1 Accepting Voices evolved in the year after the initial event as part of WHVD Sep 2012. If you attended any of these earlier versions then you will have missed some important info and may choose to attend the full workshop but it is not a requirement. If you have questions please get in touch. Increase and deepen your own understanding of hearing voices as a normal human experience, maybe not shared by everyone, but part of what it means to be human. Share information about who hears voices helping to demystify the phenomena and start conversations about how it is part of being human. 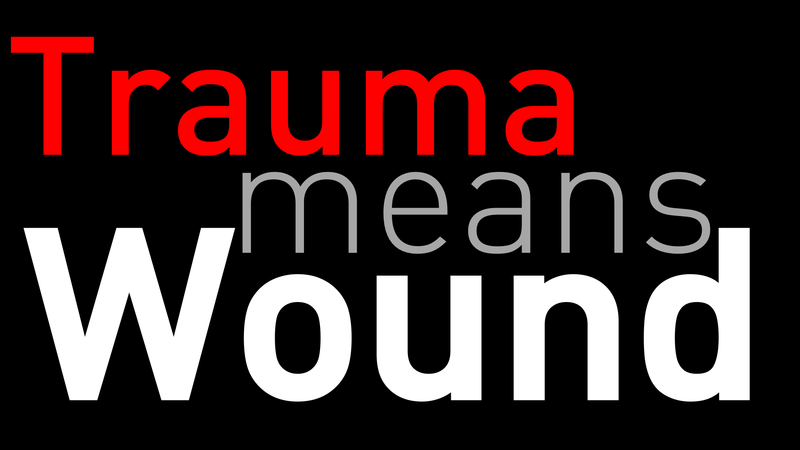 Develop a deeper understanding of the role voices can play in trauma. Begin to work with approaches that can help discover how voices may be related to life struggles, offer powerful insight and clues to what a person can do to make changes. Offer yourself as guide or partner for a person you support – walking alongside a person who chooses to work with the voices they hear. Work with practical approaches for working with voices that can enable a person to find their power to reclaim their life and make changes in their own experience. Reflect on and share your own challenges, learning, assumptions, and growth as a human being and in any of your roles. This is an intensive, highly practical and experiential workshop- a learning circle in which we learn with and from each other. Has been hearing voices you don’t for almost four decades. 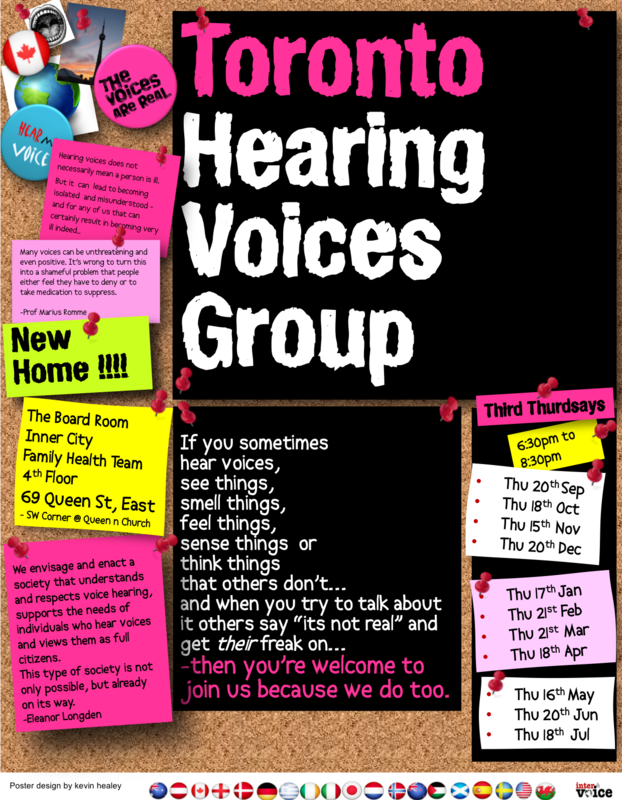 Has played a key role in establishing Hearing Voices in Toronto and also supporting others do the same where they live in Canada for almost ten years; Founder and facilitator for the Toronto Hearing Voices group, one of the longest running in North America. Draws on a career in organisational development and training and group work to design and leading unique, transformative workshops, un understanding difficult human experiences and working with people who experience them and struggle; and that participants report to be “life changing”, “mind blowing” and “I’ve had my universe tilted”. 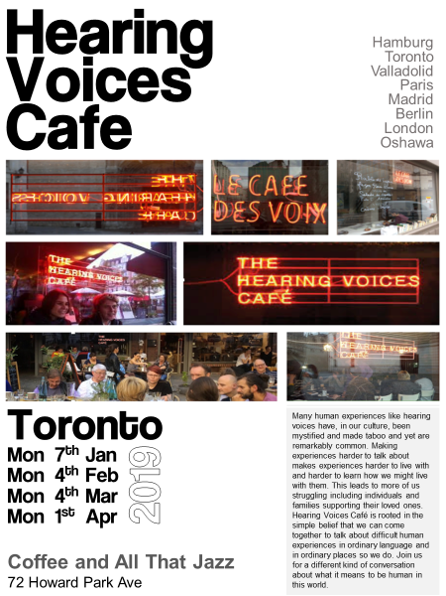 Collaborating with artist Dora Garcia on her exhibition, founded Toronto’s Hearing Voices Café, the world’s first to become a regular feature in a city landscape, there are now others in Valladolid, and coming soon to Paris and London. Has been a WRAP facilitator for eight years and had the privilege to introduce about 500 people to this way of finding answers to questions like “what works for me?” and for taking back our own power. As Advanced Level WRAP Facilitator now coaches, mentors and trains WRAP facilitators. Led the design, development and delivery of training for volunteer Peer Supporters for a leading MH charity; rooted in human values and simple ideas like “peer means equal” and fully aligned with the Mental Health Commission of Canada guidelines and recovery principles. Sought out by media print, radio TV, talking about understanding difficult human experiences; recovery; Hearing Voices and inviting people to a different kind of conversation about what it means to struggle and what it sometimes means to live as a human in this world. Engaging presenter, public speaker, open about his own experiences. If you want more find it here, and here. For many years would/ could only say one word, now he authors articles at recoverynet.ca and moderates online support groups for voices to talk with each other round the world, and coaches and co presents aprpoaches like voice dialogue. He has the most fun making memes: out of things voices say, about living in a universe that mostly comprises what he refers to as The Weird, and his own wry observations on the human obsession with categorising and calling each another horrible names. His favorite pastime is pretending to be a jelly bean and remarking upon how “voices” and “humans” behave in ways that are often very much one-like-the-other. This entry was posted in hearing voices, Ideas, Training. Bookmark the permalink.